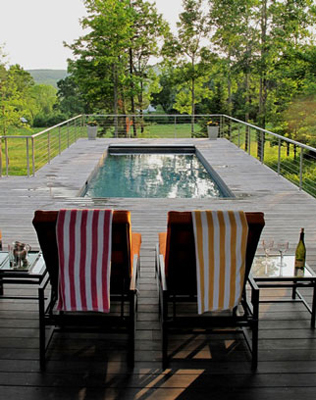 Our clients needed a swimming pool to lure their children up to the country. They wanted it to be small and placed near their existing tennis court, with an extra little building to house a bathroom, storage for pool supplies, and tennis rackets. We included a porch that works simultaneously for tennis watching and pool lounging, and utilized an existing steep slope dropping away from the tennis court to avoid a code mandated pool fence. Where the slope up to the tennis court would make the differential less than the required four feet, we raised the stone walls up to a height of eight feet above the pool deck. These higher walls create the supports for the porch roof. 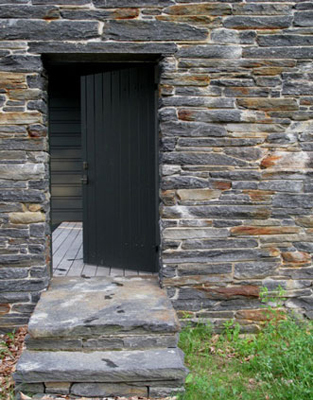 A solid door in the stone wall completes the structure and evokes that Charleston porch experience of surprise at opening a door not into the expected front hall, but back outside.